There are many different types of bathtubs on the retail market today and choosing the one that is right for your home is a matter of personal preference. Bathtubs can come in all shapes and sizes and in many different colors than the plain white of decades ago. Today, the bathtub can make as much of a statement for your bathroom décor as the lighting and sink that are installed in the bathroom. 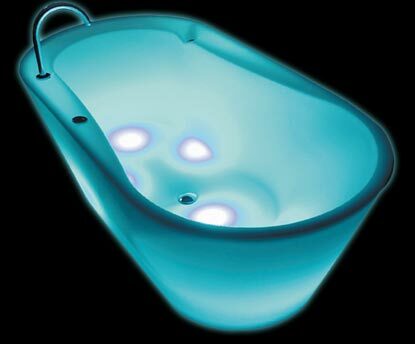 Most bathtubs today are made of either fiberglass or acrylic, giving them great strength and making the bathtubs very easy to manufacture in many different colors. There are some bathtubs that are created by layering thick enamel over a cast iron or steel frame and others that are created entirely out of copper. Some manufacturers even create their bathtub models out of composite materials. Some of the most common types of bathtubs purchased by consumers today are the drop in bathtub, which include deck mounted bathtubs, pedestal mounted bathtubs, and floor mounted sunken bathtubs. These bathtubs are generally large enough for an adult to soak themselves in and can include whirlpool features for a massaging element to the water in the bathtub. These bathtubs come in many different designs and colors and many manufacturers can custom create one of these bathtubs for your home. Another common type of bathtub purchased today is the clawfoot bathtub, one of the most classic styles of bathtubs around. 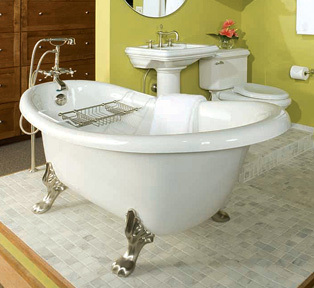 A clawfoot bathtub sits above the floor on four small feet and often can be placed anywhere within a bathroom. Although most of these bathtubs are heavy, they are much easier to move around for bathroom remodeling than some other types of bathtubs. Some individuals prefer the stylish designs of the freestanding bathtubs for the bathroom in their home. These bathtubs can be created out of any number of different materials and come in many different colors and styles to match or complement any décor. Some manufacturers have begun to create stone freestanding bathtubs, a unique addition to any bathroom. Regardless of what type of bathtub is chosen, any style of bathtub can be customized with specialized faucets, spouts, and shower heads. The number of different varieties available in both bathtubs and bathtub accessories ensures that everyone that is looking for a unique look for their bathroom will be able to find the right bathtub and fixture to create the look they desire.